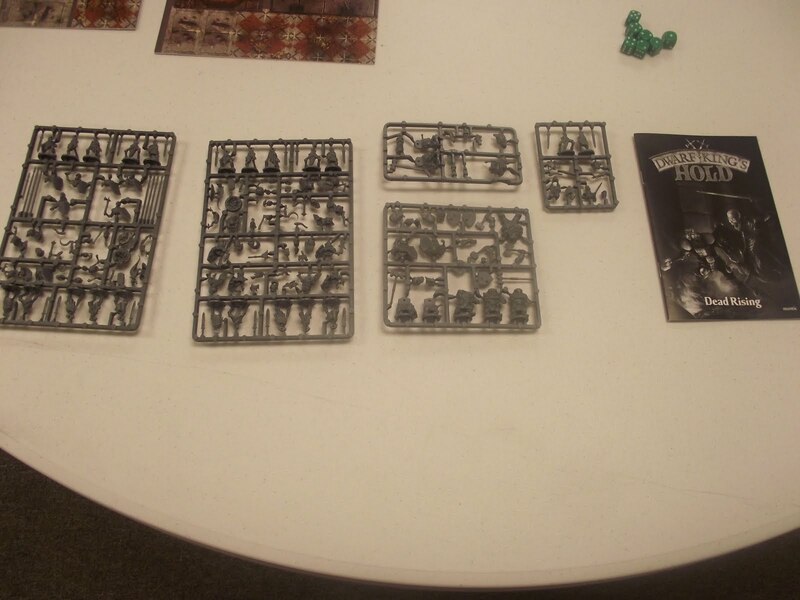 Its no secret that most of us here at KGS are fans of the game Wings Of War. 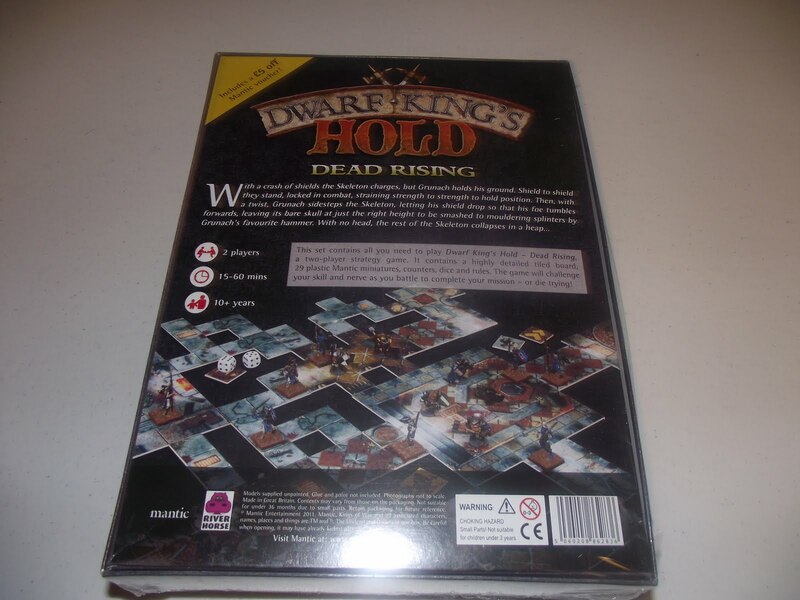 So imagine my delight when I found a game on the internet that is almost identical to it. So I gave it a try and was blow away, quite literally, with how similar it is to Wings of War for all the right reasons. In fact the team who made Steambirds probably played Wings of War and decided to make a game just like it, except its free to play. Now because gameplay is very similar to Wings of War, I won't be as thorough as usual. Before each round has a planning phase and an executing orders phase. You drag the arrow from the front of your plane to where you want it to, instead of using movement cards. If you come into range of another plane you shot at it and it shots at you if the enemy plane has you in range. Steambirds has an excellent tutorial level which explains the how to play very well. The game is set up so you go through a story line set of missons progressing through time. On each level you are awarded 1-4 stars based on your performance. The more stars you have the higher you get promoted. I wish that this game let you have games just between you and a friend or the computer and not in a mission. One major problem I have with SteamBirds is that the game does not show you the enemy's guns. Neither where they are or what they're arch and range is. This can be a major pain when trying to attack a blimp and not knowing where the guns are. It seems like something obvious that you would put into a game like this. While SteamBirds may have the advantages of being free and taking up much less space to play over Wings of War, it doesn't make it better. The reason being that you can't play SteamBirds with friends, but you can with Wings of War. Steambirds is fine to play on your own, and it is a good game. But Wings of War is simply better. SteamBirds was made by Andy Moore, Daniel Cook, Jordan Fehr, and Danny Baranowshy. Sorry about this late edition. I was at a baseball game yesterday with skybox seats so posting slipped my mind. But I know how to make up for it. Over the last few weeks I have been reviewing games that I like to play. But as you can imagine, every game cannot be good. And so this week I have a game i tried awhile ago and never played again; Railway Valley. You are in charge of a railway company. The object is to build rail lines from certain buildings to others and deliver them to get money. Over time new buildings appear and you have to extend the line to get to those building. Sounds very simple, right? But then comes the first snag. The instructions are useless. Instead of telling you how to build track and make junctions, the instructions just tell you what they are. They don't tell you gameplay mechanics, just describes the game. Perhaps they're definition of instructions is different from mine, but instructions to me means explaining how to play the game, not a biography of the game. And when you hit new game, then it explains the buttons and what they do. But still not how to play. The game itself is too complicated and the game gives you very little time to set up tracks. It might be easier if it would tell you how to play, but I don't think so. Its a good idea and I know that simlulations similar to this have worked., take RailRoad Tycoon for example (a PC game, not an online game). This game simply is far too difficult for me and the majority of those who have played it on addictinggames.com. The website has a poll under the game of who like and and who hate it. A good game would have above 60% like. This game has a terrible 38%. I think that however made this had a good idea for a game and could have made a great game. But this is a complicated and frustrating mess. Maybe someone enjoys a really complicated game. But I don't like a game this complicated. The descrition of the game says "train wrecks are everywhere". Well I disagree. There's only one train wreck here, and it isn't on track; its online. On Friday I went up to Philadelphia Comic Con (aka - Wizard World East, aka Wizard World Philly) to scout out my plans to podcast from the event next year. It was a good crowd on Friday, I think it's going to be a lot of fun if we can pull it off. While there I found some back issue comics I have not been able to find anywhere else and I also picked up some cool Harry Potter prop replica wands and patches. More details on our on-site podcasting plans through out the year. We did our best podcast yet last Tuesday and when I went to post it to iTunes I noticed that nothing recorded. Our magical podcast machine died. So I am looking at getting some better, more professional gear. The podcasts will resume very soon. Sam hosted an Atomic Highway game, which is always very popular. 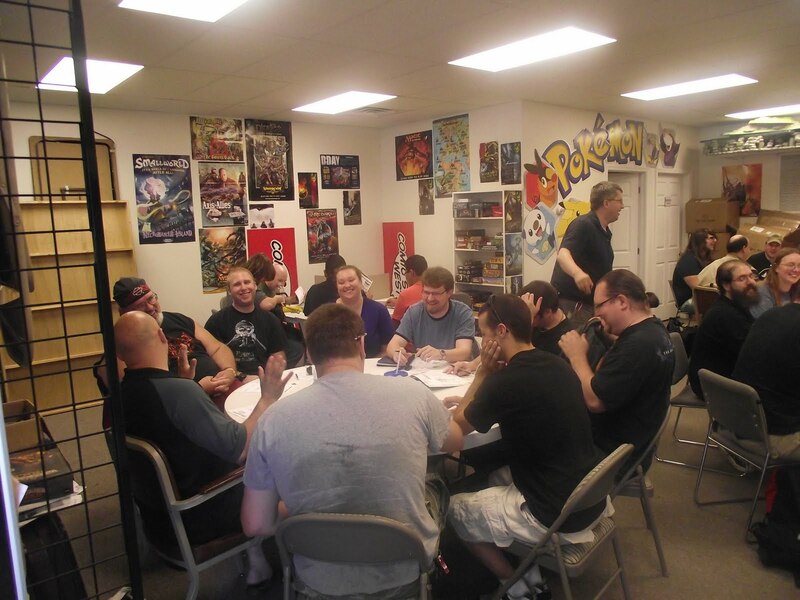 Brett (honorary member) hosted a D&D 4th Edition game. Well, I just came back from watching Green Lantern with Sam and my bud Andy. My first reaction to the Green Lantern film is mild confusion. I spoke with two rabid Green Lantern fans after the film (they loved it) and they seemed to have a lot of knowledge that filled in the gaps. Quite a few character relationships and actions left me scratching my head during the movie. I didn't even know the names of many of the characters and the one bad guy seemed to be totally unnecessary. Just too many characters, period. Also, the movie just seemed LONG. It seemed to lack forward momentum in parts but perhaps this was compounded with my general confusion about who the characters were and why they did what they did. We saw the movie in 3D and I've got to say that I had no problem with the 3D at all. Obviously this film was made with 3D in mind because it wasn't dark or blurry like Thor 3D was. Bottom line: I think fans of the Green Lantern will love it but it will fail to impress general movie audiences. Is this the first film in the Justice League series? If so, I don't think they're off to a great start. Since its inception Ask A Ninja has gone professional - the Ninja With No Name has since gone professional. His earlier videos are the best and he's had some missteps like movie promos for films like "Blades of Glory." You can, of course, find these videos at YouTube or at www.askaninja.com. 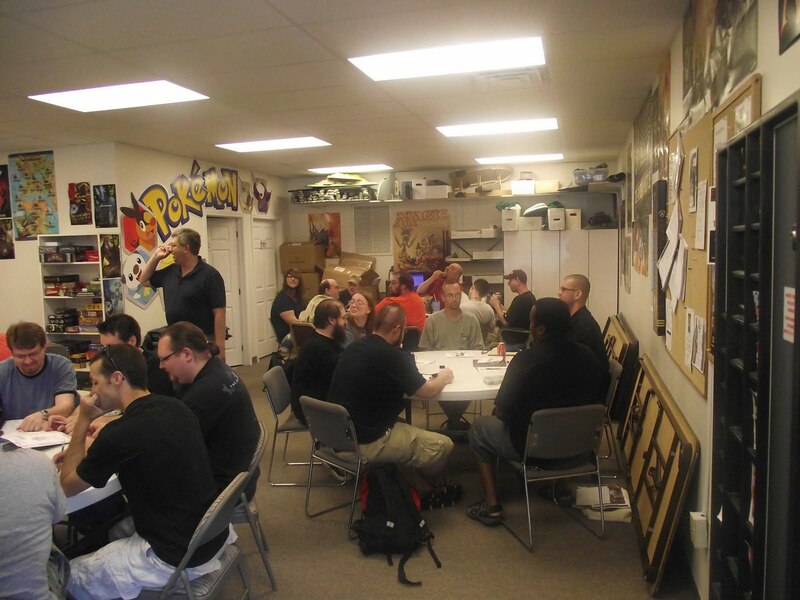 The first ever Buckeye RPG - Keystone Gaming Society joint summit was held in Ohio this past weekend. Movies were watched. Soda was drank. Games were played. Gifts were exchanged. Snack food was consumed. Small countries were forced to surrender their sovereign lands. Fun was had by all in attendance. Flash Gordon - Cult classic B movie with a criminally insane bird man. Fandango - Kevin Costner buddy road trip movie. Katt Williams comedy special - Might be funny if you're black. Bill Buhr comedy special - Hilarious! Time Traveler's Wife - A good time travel movie AND romance. Time Bandits - British humor and B-movie special effects! Hot Tub Time Machine - Funny time travel is back! Watership Down - Animated film about rabbits. Aristrocrats - One joke, analyzed and told over and over again in very, very, very dirty ways. David Hasselhoff Roast from Comedy Central - It's almost too easy to make fun of the Hoff. A Clockwork Orange - Weird Kubrick film (that's redundant, I know) about teens that get in trouble with the law. Highlander - It's a cult classic but I didn't think it was really that great. Southpark's latest episode - Funny, and I don't even like Southpark! X-Men - A great superhero comic book film! X-Men 2 - Better than the first! X-Men: Wolverine - A good film but you should stop watching before the boxing fight with the Blob. In my estimation, Fandango was the single best film watched. All but forgotten except for the name of the movie ticket website, this film really dynamic characters and an interesting plot. Just plain fun. 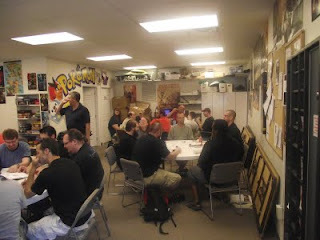 KGS is looking forward to the next get together with Buckeye RPG! The Keystone Gaming Society midnight movie #3 is upon us! It will once again be at Frank's Theater at the Queensgate 13 in York, PA. The show starts Thursday night / Friday morning at 12:00 midnight. Should be good - the picture below is one of the exciting scenes from the movie. Before you ask, I am not gay. This is actually a fun game, despite the rather homosexual title for a man to play. And who doesn't like sugar? Sweets as we know them would not exist without sugar. With this kind of connection its no wonder some gamer made a game revolving around sugar. And by sugar is this game interessting. Fill up a cup with sugar. Sounds easy right? At first, it is very easy. But then you must fill up two cups with sugar. Later on the game adds different colored cups which you must put some sugar through to get it to count in that cup. There is also a button on some levels that reverses the gravity. What you do is draw a line from where the sugar comes from to the cup. The sugar comes from the comma after the first sugar. This is a game mechanic I will talk about later. Each cup must be filled up with 100 of the correct color of sugar cubes. There are special dotted lines that change the suagr's color when they pass through. After a few minutes, the sugar stops coming out of the comma, and if you have not filled up the cups, you lose. On some levels you only have 1 sugar cube that foes in a cup that needs 1 sugar cube. Other levels will require you to switch the gravity, which the level provides you with. The key to this game is drawing lines that allow you to fill up a cup and change the flow toward another cup. Now about the comma. This reveals a mechanic I have not experienced before in a game. 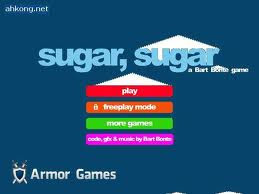 The text the is on the screen in the level can affect the sugar coming down. This can impact the game in a big way if you don't know that the text blocks sugar. I fell for that when I realized the text doesn't disappear after a few seconds. This is the first game I have encountered that has this kind of interactive scenery. I say interactive because I don't want to call in intrusive. Once you get used to this, you have to play keeping that in mind. And all this culminates to the skill of the game's creater, Bart Bonte. Now either this is an old game or he made this in some kind of cheap game maker. Either way te options for making complex games is difficult and a more resourceful mind is needed. 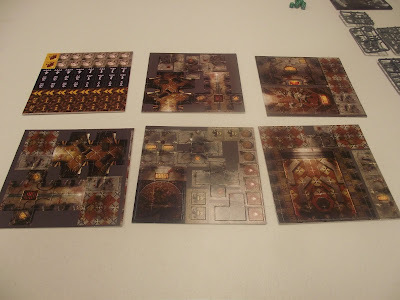 I find it sheer genious the Mr. Bonte has taken such basic elements and made such a complex and challenging game. Out of any game I have played so far, this one has stuck out from the rest, and I tip my hat to his game making abilities. And again, I am not gay, though it seems I just kissed his but 5 times just now. This story is from KGS fan, Bill P.
Star Wars fans never stop surprising me with their rabid dedication and creatively. George Lucas never ceases me amaze me by being a tool. I mean, what reason could he have for fighting this... unless... HE'S A SITH LORD! Yes, of course! Who wouldn't want the good ol' USA to have this power but a Sith Lord! It all makes sense! George is the "Emperor" - behind the scenes, manipulating, "directing" if you will... while the whole time amassing power for himself, letting the citizens of the empire suffer! Build that AT-AT, boys, then use it to overthrow the Sith Lord's influence over the Star Wars films so we will finally have Episodes 7-9 like we justly should! Thanks, Bill, for bringing to light this threat to the galaxy. KGS fans, keep this stories coming... for the safety of all the known universe! Set a time 3000 years before the Star Wars that we know Star Wars The Old Republic is a Massive Multi-Player Online Game where you'll be able to play out the role of you self made hero of old. Watch that and you probably be wondering how you can play. Well you can't. If your not lucky enough to be accepted for the Beta testing, going on now, then you'll have to wait like the rest of us for the release date to be announced. Wander around the site ( www.swtor.com ), none of the videos disappoint and the spaceships are incredibly cool too! Be warned though, if you start browsing around the site your only going to make yourself want to get a better computer and sell a first born child to get into the beta. 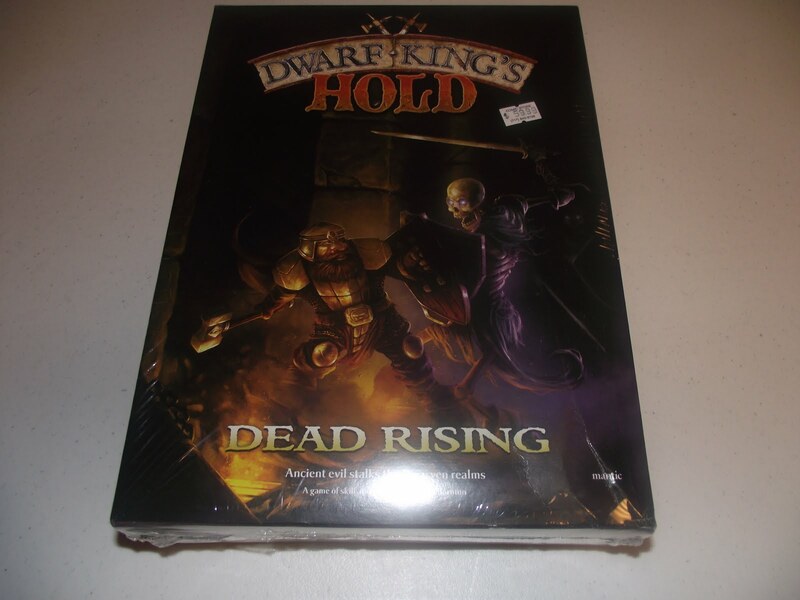 It might seem that we arbitrary picks what RPG's we play and review but that would be far from true. 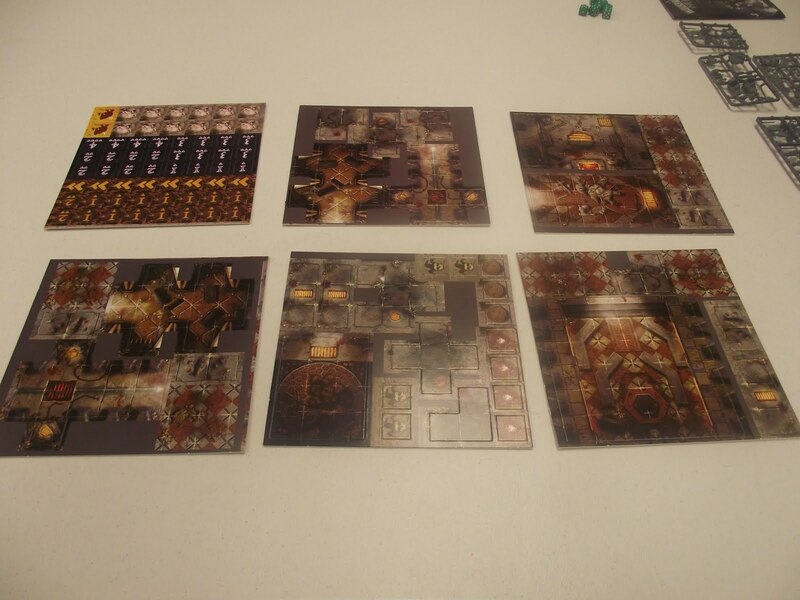 We actually work from a list that we've all voted on, around the perfect gaming table it would mean that we're playing the games that the majority of us most want to play. As I mentioned above you can expect us to get to number 5 or 6 before we toss this list out and make a new one. So how did we get the list? With allot of discussion we decided on a day that we've vote on our next game. The week following that (it never works out like we plan) we brought with us, to the store, arm loads of game books that each of us wanted to play with the group. Each of us gave a synopsis of each of our games before we started the voting. 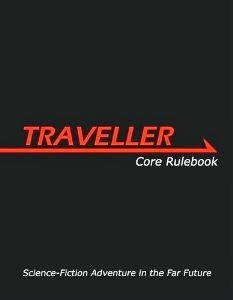 Mutants and Masterminds, Lone Wolf Multi-player, Marvel D100, The land of OG, Space 1889~Savage Worlds, Necessary Evil~Savage Worlds, Deadlands~Savage Worlds, Deadlands~1996, True D20 (Fantasy), InSpectors, Serenity, Star Trek~Decipher, Judge Dread~Traveller, HOL, Paranoia, High Medieval, Star Wars~WEG, D6 Space, D6 Adventure, D6 Fantasy, Prime Evil, Teenage Ninja Mutant Turtles, Toon, Mercenaries Spies and Private Eyes, Connan Revised Edition, Traveller, Dr Who. Space 1889~Savage Worlds, Deadlands~Savage Worlds, Star Trek~Decipher, HOL, Paranoia, High Medieval, D6 Space, Teenage Ninja Mutant Turtles, Mercenaries Spies and Private Eyes, Connan Revised Edition, Dr Who. There it is, the behind the scenes working of KGS and how we decide whats next. 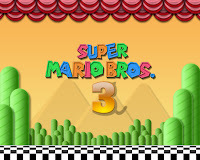 Do you like Super Mario Brothers but don't currently own a Wii or DS? 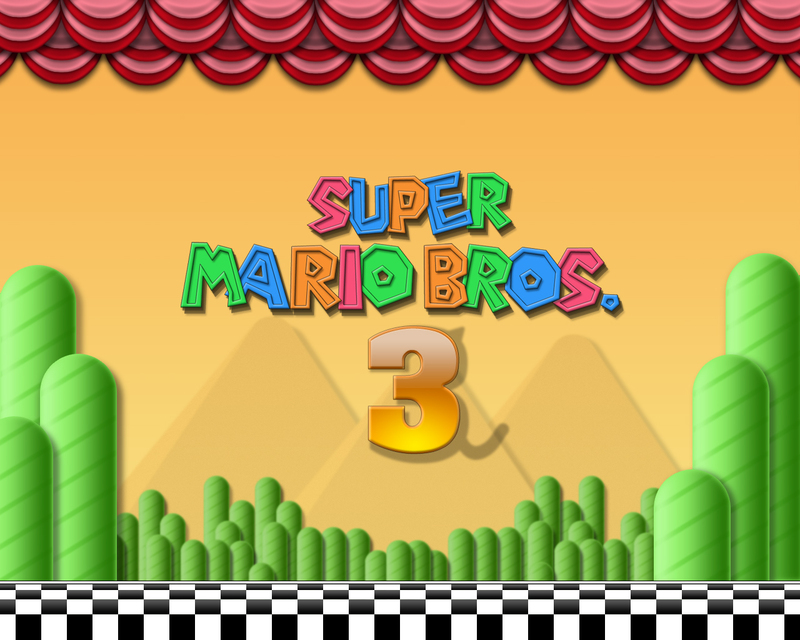 Then check out http://www.supermariobrothers.org/ which gives you the chance to play fan-made games based on the famous franchise. And when I say based on, I mean "almost exactly the same in every possible detail." You can either download games or play flash versions on the site. I've played the download version and it is superb though I do sometimes struggle playing it with a keyboard instead of a controller. The games are a lot of fun and get me my nostalgia fix for free. Take a look for yourself. 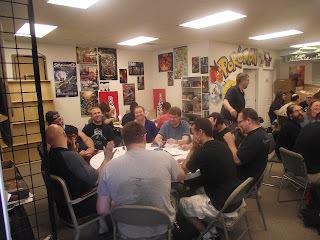 This is what happens when a customer calls and another comes into the Comic Store West while three members of KGS were trying to do a video of the Opening of the new Miniature/Boardgame - Star Trek Expeditions. Enjoy. Popping balloons is always fun. Whether it be at a carnival game or at a child's birthday party. But what if there was a game that let you pop balloons in a tower-defence style game? Then I have so good news for you. And that good news is Bloons Tower Defense. The game gives you 5 different types of towers. A dart tower, tack shooter, ice, bomb, and a Super Monkey towers. You can buy these towers and upgrades with money which you earn for completing a level and from popping balloons. If 100 balloons get past you in total, you lose. There are two kinds of upgrades for each tower. One deals with range and the other amplify's the effects of the tower. There are many kinds of balloons. Red ones are the slowest. Then there are blues, which are faster, and have a red balloon inside. Between levels when the game is paused, the game will give you tips and information about the game that is apporpriate at the level you are about to do. Essenctially, most balloons have more balloons inside of them and have to be popped serveral times to degrade it to a red balloon. Some balloons are immune to certain attacks, like lead balloons are immune to darts and tacks. There are many strong points to this game. It is simple to understand and challenging. You need to stratgically place you towers to get most out of their abilities. The hints in between levels is unique and helpful. Sometimes the game is just telling you what is heading your way next. You could say it ruins the surprise, but if you have nothing that will affect what's coming up, you're in trouble. But then I realized something. That while having gameplay adive between levels is unique, is it better than just having a screen that tells you how to play. Like an instructions or a tutorial page. The problem that comes with telling the player in between levels is that they have to survive the level to get it. And about halfway through the game this could be a challenge, when you could have told them before. But there is a reason why there are three new versions of Bloons tower defense that NinjaKiwi has made. The game is great. And there is alot of room for expansion in the number of towers and balloons there could be. I find this series of games to be a personal favorite of mine that I go back to again and again for free fun. Bloons Tower Defense is made by NinjaKiwi. I'm just back from watching the first midnight showing of X-Men: First Class - it's 3:30 in the morning and I am still trying to absorb this amazing film. This movie is nearly flawless from beginning to end. This isn't just a good comic book movie - it's a good movie. I would even struggle to classify this as a "superhero movie" because it is much more character driven than action driven. The big, epic battles don't take up very much time on screen. Instead, this film really gets intimate with it's large cast and examines their inner workings and relationships to each other. This film clearly aligns itself with a set period in history and I loved how it used actual historical events as the backdrop for its story. One of my big concerns going in was continuity - how did this film fit in with the other X-Men films? My first impression is that it is flawless. Clearly this film sets up the other X-Men films brilliantly. I didn't notice any obvious contradictions although I'm going to have to go back and watch the other X-Men films just to double check! I think this movie will be enjoyed by fans by general movie audiences though I do feel that fans of the X-Men that have seen the first three (or four) films will get a little something extra out of it (there are a lot of little nods to long time fans and little easter eggs that they will pick up on). So far, X-Men: First Class is the summer blockbuster to beat. Dare I say the best X-Men film to date? Dare I say one of the best comic book movies of all time? Yes, I do. Oh - one last thing. DON'T STAY THOUGH THE CREDITS. THERE IS NO CLIP AT THE END OF THIS FILM. The audience I was with actually booed when the credits finished. Come on Marvel - the fans expect it! Why put a bad taste in fans' mouths after such an amazing film? Barats and Bareta = comedic gold! This pair of filmmakers hit it big when their "Cubical Wars" video went viral. They crank out videos at an amazing rate. They literally have scores of videos cataloged. They don't shy away from any subject their - they're equally likely to make fun of religion, themselves (usually implying awkward homosexuality), video gamers, basketball, or office life. When I watch these videos I get the idea that these guys grew up just like me - playing Nintendo, DnD, and going to church. Check them out on YouTube (where almost every video has hundreds of thousands of views) or at www.baratsandbareta.com.